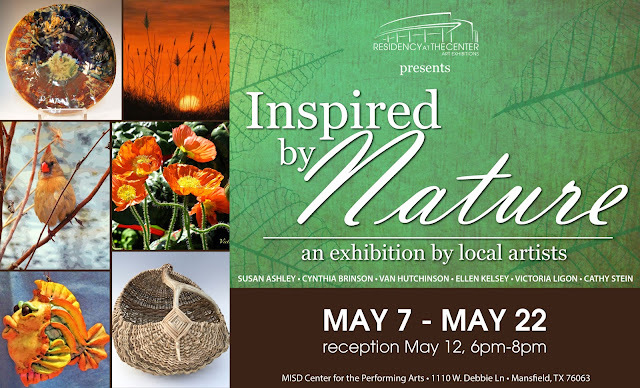 All six featured artists plan to attend the reception on Saturday, May 12 for the Inspired by Nature Residency at the Center art exhibit from 6-8 pm. You will be treated to high fire ceramics, photographs, basket and gourd weavings, paintings, mixed media pieces featuring polymer clay and photographic art images. Browse over 70 pieces of art, all inspired by the natural world around us. If one speaks to you, you will be able to purchase it, however it must remain in the exhibit through May 22. In addition to the reception from 6-8 pm this Saturday, the exhibit is open to the public at the Mansfield ISD Center for the Performing Arts from May 7-22, Monday through Friday from 8 am - 4:30 pm.